Eighth Grade Movie Night Giveaway! 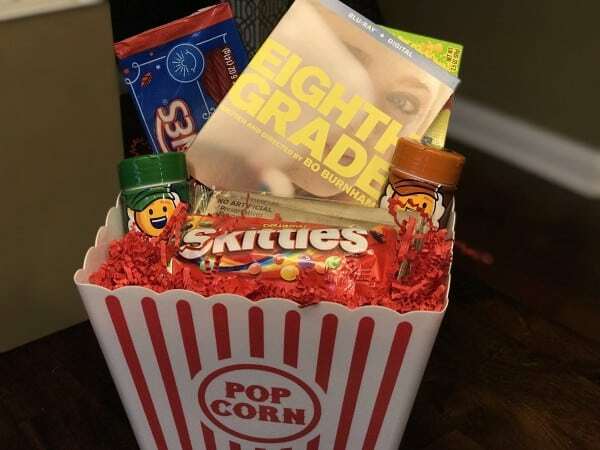 In celebration of Eighth Grade’s release on Blu-Ray and DVD, we’re giving away a the movie on Blu-Ray DVD along with a super fun movie night prize package full of popcorn, treats, and even a time capsule kit. Eighth Grade, the coming of age story starring Elsie Fisher about self-love, family and the awkwardness that is middle school is now available on Blu-Ray + DVD. This is a great movie to watch with your middle school aged kids and teens as it is full of fantastic and important conversations about fitting in, being yourself, and navigating the teenage years in the age of social media – when we are online may not represent people’s real feelings or the entire picture of their lives. Kenzie and I watched this together and both loved it. I highly recommend Parents watch this with their kids together too so they can really chat afterwards and during the movie about the challenges of middle school, self confidence, growing up, and now the complications of social media that add extra challenges that we didn’t face growing up. Giveaway open to US addresses only. 1 winner will be selected. Prize package includes Eighth Grade Blu-Ray DVD, treats, and a kit to make your own time capsule. 1. Leave a comment below by October 21st, 2018. @superdumb follows @classymommy on all the platforms! One of our kids just hit 7th grade, so this movie likely has themes she can relate to. This looks like a super fun giveaway we would so love this one. We have family movie nights in our home, so this would be a good family oriented movie. Have a great Saturday hope the sun is shinning where you are. Having family movie nights and game nights are a great way to stay connected as a family. I heard great things about this movie. My wife really is looking forward to seeing this movie. I would love to watch it with her. Hope you are having a nice Sunday thanks for the chance to win this one. We like to have family movie nights, though our kids may object from time to time!!! This movie looks so good. I plan to watch it with my daughter who is in 8th grade this year. The main character reminds me of her. I would so love to win this and give it to the Shriners Childrens Hospital for so the Children could watch it. The kids would love this one thanks for the chance. I would like this for my kids. Thanks! I have heard amazing things about this film. It looks like it truly captures the highs and lows of eighth grade. Super cute, glad there is popcorn & candy included! This would be wonderful for my nephew. I have wanted to see this movie. It looks like one my family would enjoy! My daughter is in 9th grade this year. 8th grade was her favorite year so far. This would be a great movie to watch with my nieces! Oh, I really want to see this one. And I love that Bo Burnham directed. Fingers crossed that I won this one. Hope you have a wonderful fall day the trees are just beautiful here. My daughter just started 8th grade and this is so true to life. I watch her everyday going through a lot of what we did growing up from friends to social issues to self awareness. I really want to see this movie. It seems so nostalgic. This would b a fun movie ti watch. Thank you! I missed my chance to see this one in theaters. Thanks for the giveaway! I’d love to win this for my niece. The kids would so love this one looks like a fun giveaway. It has been one busy Friday. I have an 8th grader who would love this. Happy Saturday! Have a great weekend! I have an 8th grader. This would be perfect. Have a nice Saturday relax and enjoy the season. I think my family would enjoy this one. We love movie nights! I follow you on Facebook (Hesper Fry). This would be a lot of fun! It sounds like a great movie. I would love to watch it. Ready for some football! Have a great Sunday. My daughter is currently in 7th grade. I’m sure she would like this movie! missed this in the theater but hear its awesome. Fingers crossed to win this one. Elsie really was astounding in this role! I can totally relate to this film! Love it. This would be great, thanks. I’ve heard about this movie and would love to watch it with my daughter. I don’t know if I could relive 8th grade again but I would enjoy eating popcorn and watching this movie. Sounds like a great movie!